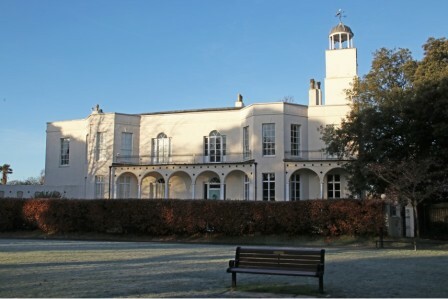 Welcome to the Hotham Park Heritage Trust website, protecting the legacy of Sir Richard Hotham. If you can help us in the conservation of Hotham Park and it’s protection for future generations we would love to hear from you. Please click this link or visit our ‘Membership’ or ‘How to Help’ pages for more info. 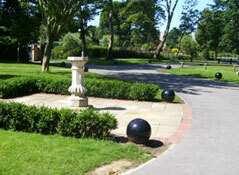 Hotham Park Heritage Trust was formed in 1998 to safeguard and improve Hotham Park in Bognor Regis. The Park is Bognor’s largest and most central green space, and was established in the 18th century by Sir Richard Hotham. The house he built is grade II* listed and is privately owned. 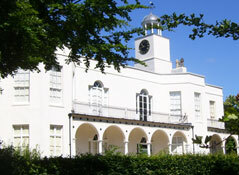 The clock tower attached to the house contains the oldest clock (1794) in this part of Sussex, and the Park was farmland in Sir Richard’s time. Significantly, William Fletcher was the owner who developed the land into the beautiful parkland we all enjoy today. The Trust is a non-political, non-sectarian and non-profit making voluntary organisation designed to protect the heritage of Sir Richard Hotham, founder of the town, and of the Park’s status as a conservation area as created by William Fletcher. The Park opened to the public in 1947 and the Trust is an important factor in its future sustainability. 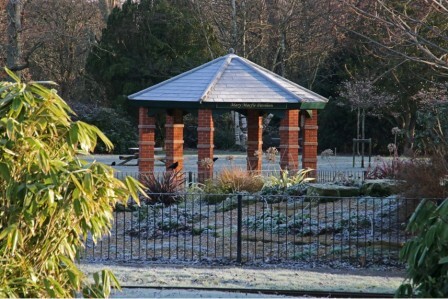 Following the successful application to the Heritage Lottery Fund in 2006, in which The Trust acted as a key partner with Arun District Council, the Park was awarded 2.2million pounds and now has an additional 5.5 acres of open parkland and covers an overall area of 9 hectares (22 acres). The Trust’s Members are all Volunteers and their mission is to ensure that the Park reaches its potential as an invaluable community asset that makes a substantial contribution to conservation, ecology, health, education, regeneration, cultural and community cohesion. The Trust represents users of the Park and it produces an annual calendar of meetings, talks and outings agreed with its membership. 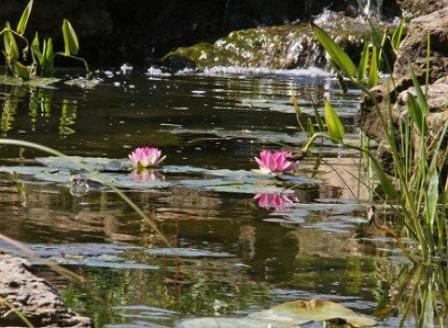 Fundraising events have raised considerable sums for the Park, the largest contributions being £18,000 toward the children’s playground, £6,700 toward restoration of the clock tower, £5,000 for plants for the ornamental pond garden, and 9 park benches costing over £1,000 each. Our greatest fund raising event is the Hotham Park Country Fair held over two days in August every year. 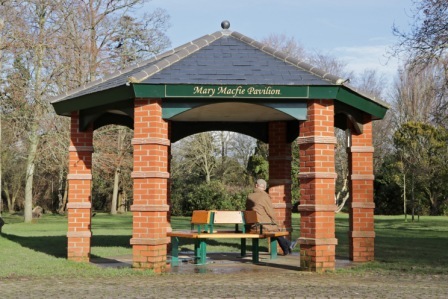 The Mary Macfie Pavilion, which is located in front of the ornamental pond, was installed in 2013 and funded by a bequest to the Hotham Park Heritage Trust. Aldwick resident Mary Macfie loved the park and wanted to make a lasting contribution to the place she loved. 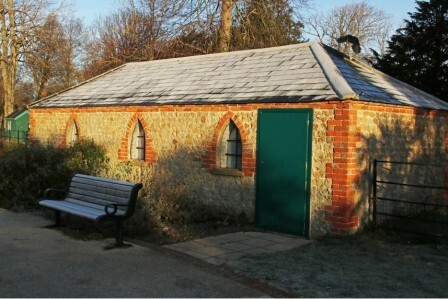 Her instruction to the Hotham Park Heritage Trust for a permanent structure in her name enabled this new shelter to be built and, with additional monies from the Trust, lighting and power was installed. In February 2017 the Trust were pleased to add seating for the public to enjoy, as shown below. 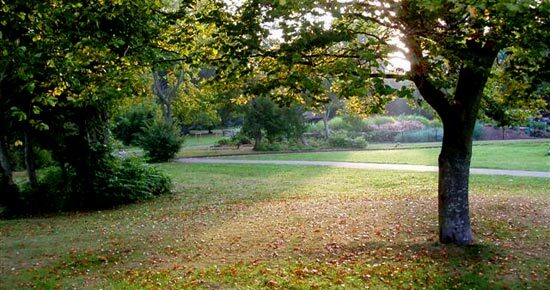 There are over 100 varieties of tree in Hotham Park and many of them are well over 100 years old. 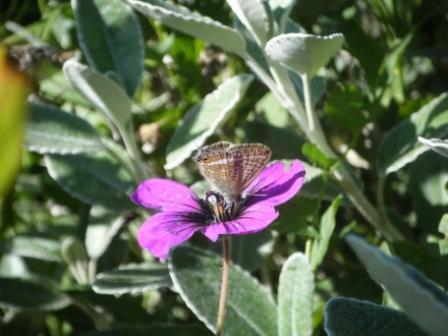 It is a haven to wildlife giving pleasure to people of all ages and always looks beautiful, even in the winter. The pictures below were taken in January 2017. The Trust’s Headquarters are situated in The Lodge adjacent to the car park at the main entrance. You can help us to protect the historic parkland by joining the Trust. Follow the Membership link.